This Christmas marks six months since West Yorkshire’s first minimal waste shop opened its doors. Waste Not in Burley-in-Wharfedale, near Ilkley, is the brainchild of Charlotte Hawkins and aims to help customers cut the amount of plastic they use and discard. And there is no better time to think about cutting unnecessary waste out of your life than during the annual celebration of over-indulgence that is Christmas. Charlotte stocks loose dry food that shoppers can take home in their own reusable containers, as well as alternatives to single-use and disposable plastics, such as reusable sandwich wraps, bamboo toothbrushes and refillable coffee cups. “People are really starting to think about the amount of plastic they use,” says Charlotte. It certainly does seem to be a hot button topic thanks to several shocking reports on the amount of plastic that ends up in the ocean, endangering wildlife. The recent BBC series Blue Planet II even ended its run with an impassioned plea by national treasure David Attenborough, imploring viewers to act over the issue. But are people really engaged with the debate enough to head to the shop with their empty containers? “I’ve had a great response from people so far, with a lot of my customers reporting that their bins are much emptier every week thanks to the way they buy their food now”. Living the minimal waste life seems to be a powerful combination of knowing you are doing something for the greater good, but also witnessing benefits for yourself almost instantly too. 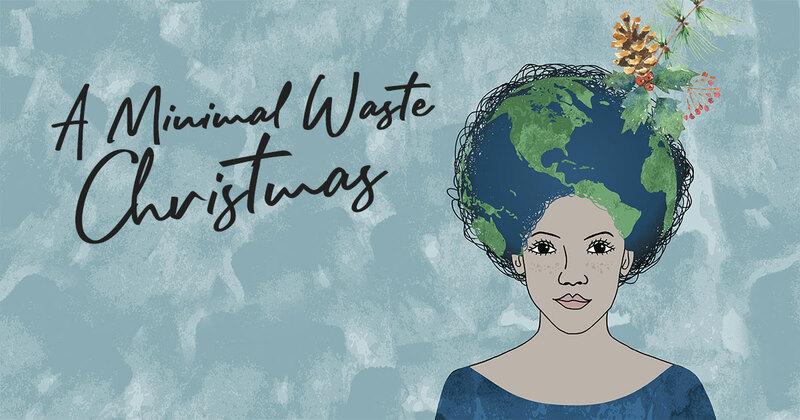 If you’re sick of the bins overflowing for a fortnight or scraping enough leftover turkey dinner to feed a particularly hungry army from your family’s plates, Charlotte from Waste Not has some suggestions for minimising waste at Christmas. She admits that the excesses of the festivities with her two children last year overwhelmed her to such a point that she was determined that her dream of opening such a store had to become a reality. Christmas is one of the times of year when the whole country seems to be on the move. Of course, it is also when rail companies choose to perform a few maintenance tasks, but if you can use public transport, it helps cut down on the pollution caused by the mass exodus. Prepare thoroughly for your journey by packing up food so you don’t have to buy a limp, bland, plastic-wrapped sarnie from the station. If you take a refillable water bottle, you can keep it topped up using the Refill app, which lists companies that allow you to fill your bottle for free on their premises. whilst providing the actual items for those who could really benefit from them in the developing world. everyone buying everyone else a gift, each person receives just one, meaningful or useful present. Pick up a reusable cloth or wooden calendar and fill it with your own daily gifts. The best thing is that you can use the calendar again for years to come. You could consider making a charitable donation rather than sending people Christmas cards. However, if you really want to send them. Really consider how many you need to send. Could you trim down the list anymore? We all have people to whom we send cards out of habit rather than friendship. If you have kids or grandkids, you will know exactly how much discarded wrapping paper there is left over on Christmas Day. Charlotte suggests investing in cloth wrapping paper that can be used again. Reusable gift bags also cut down on what you must throw away. If you pick up recycled wrapping paper, tie it up with string or paper tape. If you cover it in sellotape, it is no longer possible to recycle it. For gift tags, use the fronts of old Christmas cards. The minimal waste approach to Christmas dinner is to make as much as possible from scratch. Of course, time is tight at Christmas, but a bit of forward planning will help you create the perfect dinner from scratch, without the jars and packets that clog up your bin. Try and be realistic about how much you will consume. Everybody over-caters at Christmas and reducing the amount of food you make might also have the happy benefit of avoiding chronic indigestion whilst you’re trying to enjoy the Bond film.